Many Fair Grove High School athletes have worked hard to improve, often with the goal of eventually playing at the college level. This year there has been two senior boys who have already signed to play college football. 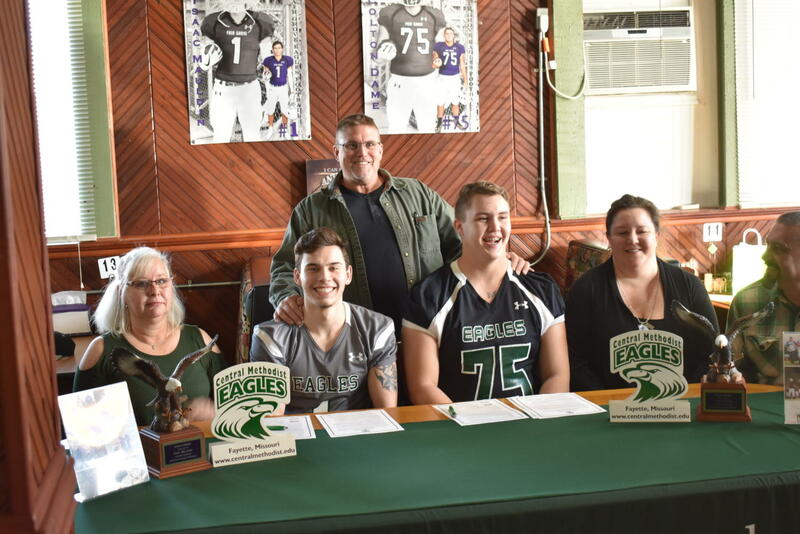 Coincidentally, both Isaac Mauldin(12), and Colten Dame(12) both decided to sign their football careers to CMU (Central Methodist University). “The scholarship they offered me I could not refuse, and their type of offense really led me to choose CMU as the college for me to continue my football career,” said Isaac Mauldin. At Fair Grove Mauldin received First-Team-All-State Wide Receiver, First-Team-All-Region, and First-Team-All Mid Lakes Wide Receiver and Returner. “I have played football my whole life and I have always wanted to take it to the next level and go from there so that is exactly what I did when I got an offer,” said Maudlin. There are definitely also tons of kids in the senior class who are signing to play sports that are not offered at Fair Grove such as Rodeo. Sierra Anderjaska is signing to be on the rodeo team at Missouri Valley College in Marshall, Missouri. “Coach Mason offered me a spot on his rodeo team at Missouri Valley so I took the opportunity to help for my future in studying vet science, and to also continue my athletic career in rodeo,” said Anderjaska. Stewart Hopkins is also signing to play a sport not offered at Fair Grove High School. He is signing to play Hockey at Missouri State University in Springfield, Missouri.